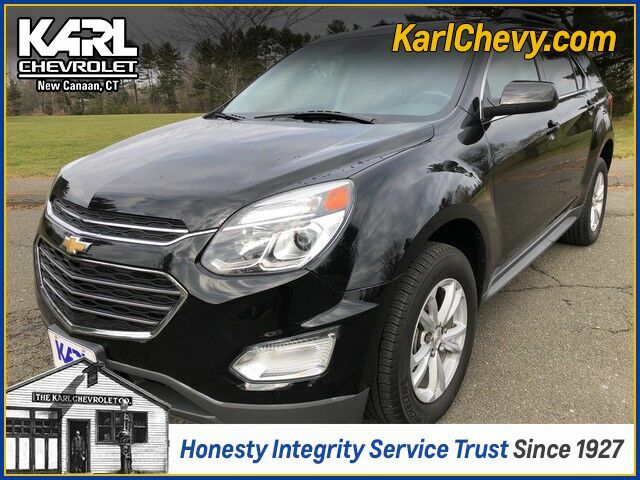 Karl Chevrolet has a wide selection of exceptional pre-owned vehicles to choose from, including this beautiful 2016 Chevrolet Equinox AWD LT. This one-owner Certified Pre-Owned Equinox offers an outstanding value and has super low miles! Sharpe looking in Mosaic Black Metallic with Jet Black Interior, features include Power Sunroof, Remote Start, Bluetooth, Power Seat, 17-inch alloy wheels and much more. Excellent all-weather traction and safety plus an overall FIVE STAR vehicle safety rating make this Equinox the perfect vehicle for a station car, daily commute or new driver. This Chevrolet includes: LPO, ALL-WEATHER FLOOR MATS Floor Mats JET BLACK, PREMIUM CLOTH SEAT TRIM Cloth Seats LPO, ALL-WEATHER REAR CARGO MAT, BLACK REMOTE VEHICLE STARTER SYSTEM Remote Engine Start TRANSMISSION, 6-SPEED AUTOMATIC WITH OVERDRIVE (STD) A/T 6-Speed A/T GVWR, 5070 LBS SUNROOF, POWER, TILT-SLIDING WITH EXPRESS-OPEN AND WIND DEFLECTOR Generic Sun/Moonroof Sun/Moonroof TIRES, P225/65R17 ALL-SEASON, BLACKWALL (STD) Tires - Front All-Season Tires - Rear All-Season LT PREFERRED EQUIPMENT GROUP AXLE, 3.53 FINAL DRIVE RATIO LPO, CARGO AREA CLOSE-OUT PANEL STEERING, POWER-ASSIST, HYDRAULIC-VARIABLE Power Steering LPO, INTERIOR PROTECTION PACKAGE Floor Mats EMISSIONS, CONNECTICUT, DELAWARE, MAINE, MARYLAND, MASSACHUSETTS, NEW JERSEY, NEW YORK, OREGON, PENNSYLVANIA, RHODE ISLAND, VERMONT AND WASHINGTON STATE REQUIREMENTS BATTERY, MAINTENANCE-FREE WITH RUNDOWN PROTECTION, 660 CCA SEATS, DELUXE FRONT BUCKET (STD) Bucket Seats CONVENIENCE PACKAGE Steering Wheel Audio Controls Remote Engine Start A/C Climate Control Leather Steering Wheel Power Driver Seat Heated Front Seat(s) Cruise Control ENGINE, 2.4L DOHC 4-CYLINDER SIDI (SPARK IGNITION DIRECT INJECTION) 4 Cylinder Engine Flex Fuel Capability WHEELS, 17" Aluminum Wheels AIR CONDITIONING, AUTOMATIC CLIMATE CONTROL A/C Climate Control MOSAIC BLACK METALLIC AUDIO SYSTEM, CHEVROLET MYLINK RADIO, 7" DIAGONAL COLOR TOUCH-SCREEN DISPLAY AM/FM/SIRIUSXM STEREO AM/FM Stereo Satellite Radio Bluetooth Connection Auxiliary Audio Input MP3 Player SEATS, HEATED DRIVER AND FRONT PASSENGER Heated Front Seat(s) *Note - For third party subscriptions or services, please contact the dealer for more information. * Your buying risks are reduced thanks to a CARFAX BuyBack Guarantee. This Certified 2016 Chevrolet Equinox LT is a brilliant example of quality meets reliability. This vehicle has been thoroughly inspected and has an assured quality that you won't find with other vehicles. Treat yourself to an SUV that surrounds you with all the comfort and conveniences of a luxury sedan. Comfort. Performance. Safety. Enjoy all three with this well-appointed AWD 2016 Chevrolet. With less than 15,632mi on this Chevrolet Equinox, you'll appreciate the practically showroom newness of this vehicle. Rest assured, this vehicle was well cared for. In fact, previous service records are included. Clean interior? How about flawless. This Chevrolet Equinox looks like has never been used. More information about the 2016 Chevrolet Equinox: Starting at under $25,000, the 2016 Chevy Equinox is one of the most affordable crossover vehicles in its class, rivaling Honda's CR-V and the Toyota RAV4. The interior features a dual-cockpit design, ice-blue ambient lighting, and sophisticated, classy appearance touches that makes it look much more expensive than it is. With available V6 power under the hood, the Equinox makes an attractive family and cargo hauler. Strengths of this model include sharp styling inside and out and Powerful and efficient engine selection As always, our goal here at KARL Chevrolet is to assist you to find the perfect vehicle to meet your needs. While we strive to have the area's best selection of quality pre-owned vehicles in stock at all times, we know there are times when a customer may have very specific needs. If you have a specific model or features that you are searching for, please let us know. You might be surprised at how quickly we can find a match! Just another KARL Advantage .... finding you the perfect vehicle at the best overall value. Thank you for the opportunity to assist in your vehicle search.